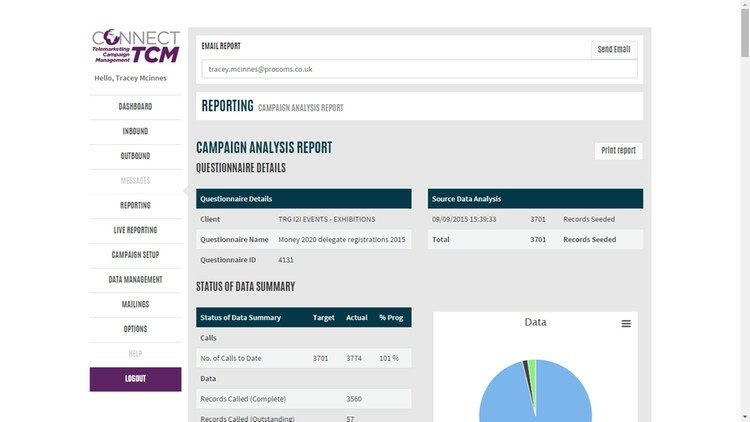 Telesales and telemarketing campaign management software as a service that can take data from Sugar and upload into a telemarketing campaign. The structure and process within Connect-TCM increases productivity and ultimately sales revenues. 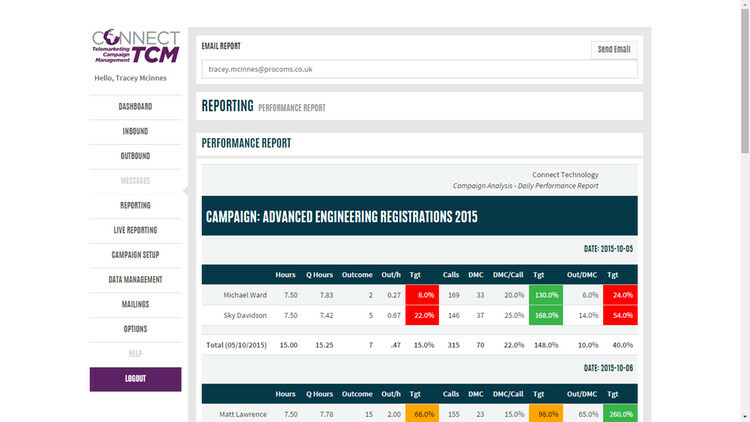 Reporting is granular and every KPI is analysed by agent and by campaign. The calling list for each telesales agent is allocated to them by using a set of criteria which is appropriate to their skill set or language or other data reasons. 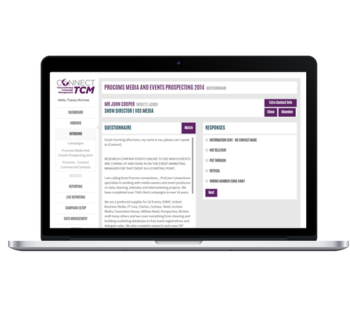 The priority order can be set and changed according to email engagement, call back dates and call back reasons so that an important call is never missed. More importantly the telesales agent does not cherry pick or sit for a while between calls deciding who to call next. 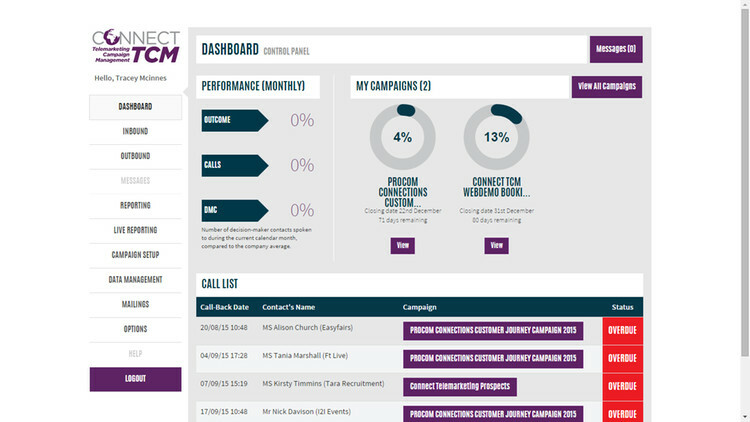 Connect-TCM provides reporting at the touch of a button and real time to show the performance of telesales agents, against one another and on different campaigns on an hourly, daily, weekly, monthly or any date range basis. Every telesales or telemarketing campaign is analysed from the data that is being collated as the agents click through their detailed questionnaire. 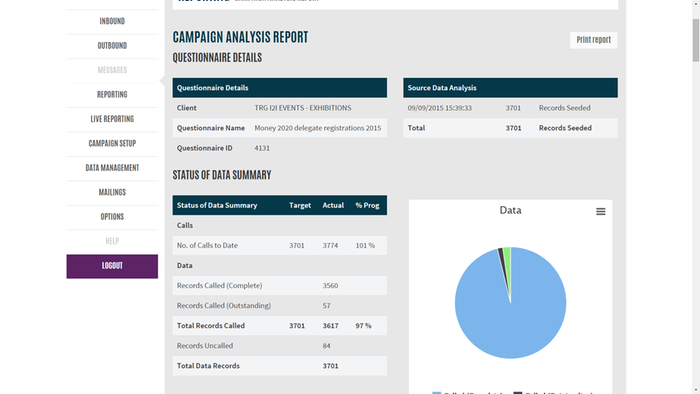 This translates into a campaign analysis which reports the overall progress of a campaign in terms of number of calls, contacts, target outcomes, data updates and other required criteria. The reporting suite gives you the opportunity to measure key performance indicators real time and at the touch of a button, for your entire inside sales team. This includes productivity and not just results. 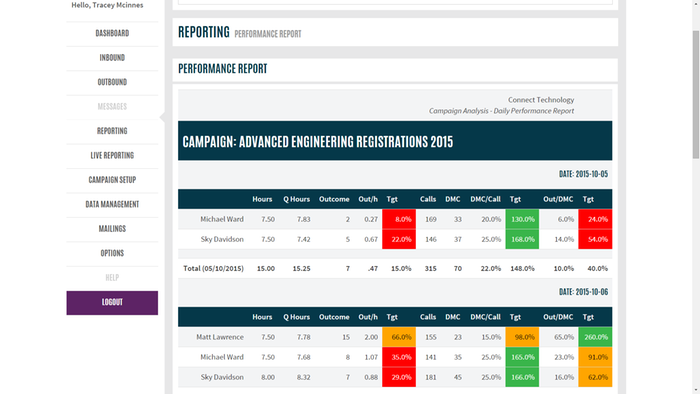 You can compare peers, data, campaigns from a centralized view without the need to collate information from multiple places. 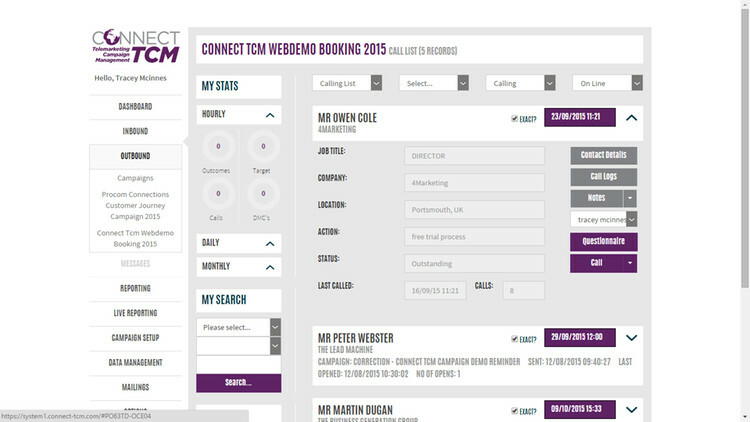 If you would like to run multiple telemarketing campaigns and manage their performance easily, this is a standard feature within Connect-TCM. You can prioritize your telesales calling list by feeding in clicks and opens straight into the live calling data, meaning you can call when someone is most engaged. Never fall foul of the Telephone Preference Service rules by having your numbers automatically blocked from calling if the contact has registered. Data can be allocated easily between telesales agents using sophisticated criteria or just randomly assigned. That data will stay with the agent until re-assigned. 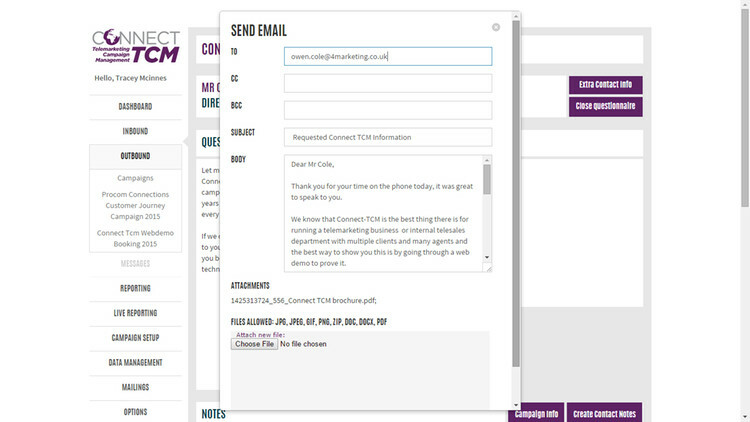 Every contact note is date and time stamped with the name of the person that made it and will be available against that record always. 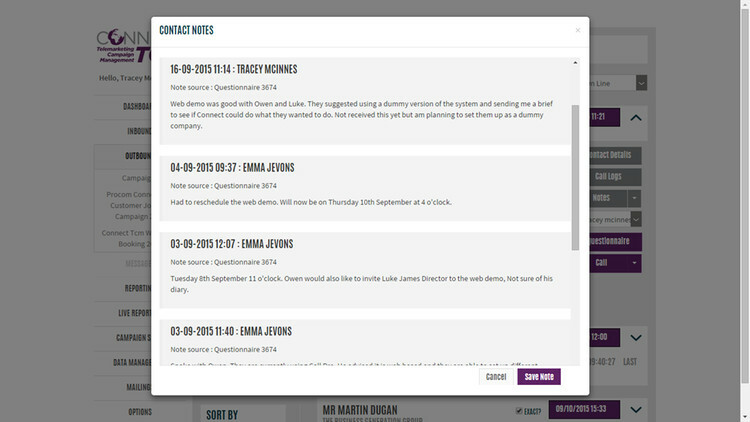 Contact notes stay with the contact but company notes can alert you to other conversations with contacts at the same organisation. The structured calling list will prioritize important call backs, clicks and opens and more general call backs according to rules. Meaning that an agent never has to worry about who to call next or if they will miss an important call. 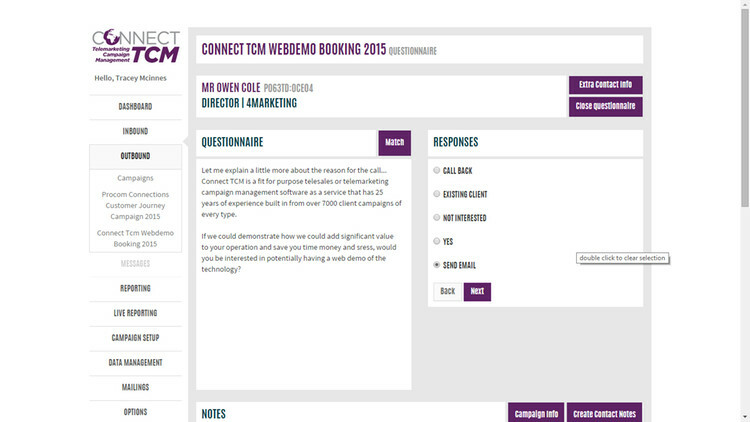 Connect-TCM has a questionnaire module at its back bone which means that you can mirror any business process using question and answers. This helps to navigate easily through a call and present information in a timely manner but also to capture information back in a structured way using different answer types. 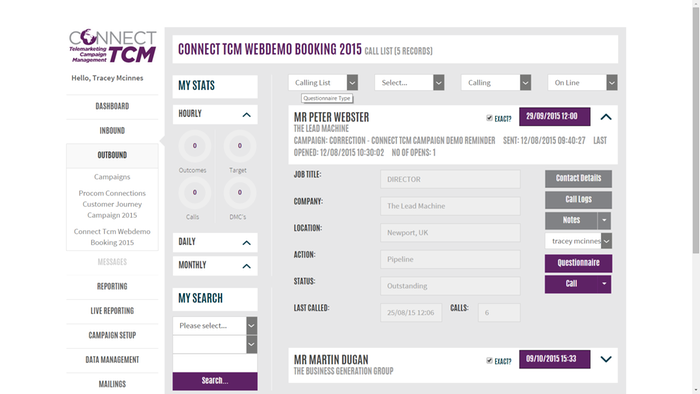 When designing your campaign questionnaire you can include automatic escalations like sending an email, a sales lead, calendar invite or customer service query which trigger as the agent clicks through an answer. Meaning that they don't have to leave the application to generate one by one emails and get distracted by administration. In order to speed up productivity, we have integrated with various soft-phones to enable click to dial from the calling list. This feature is particularly useful if you are running a 3rd party telemarketing agency and would like to keep an hour by hour track of profitability of every agent on every client campaign. It can also be used to log internal telesales hours against the return on that investment. 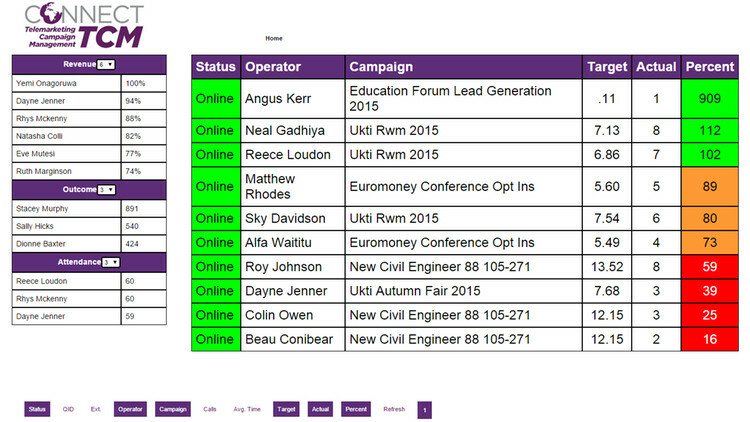 You can schedule every campaign into the system with a start and end date and you will be able to see if you are over or under resourced at any given time.